In this exercise, we’re moving down from the neck and head to concentrate on the shoulders. If you have an injury or have had surgery recently, please consult your physician before trying this exercise. As always, move through the shrugs and circles gently and slowly at first until you know how the movements will effect your joints and muscles. Begin sitting with your back straight, feet flat on the floor, shoulder-width apart. Breathe in through your nose and out through your mouth slowly for 6 breaths before you begin. As you breathe in through your nose, lift your shoulders toward your ears. Breathe out through your mouth and drop your shoulders. Shrug and drop 12 times. Circle your shoulders to the back 12 times as you breathe normally in and out through your nose. Don’t try to match your breaths to the shoulder rolls. Now, circle your shoulders forward for the same number of times. Continue breathing in and out through your nose only without matching the breaths to the shoulder movements. You can use this relaxing exercise any time throughout the day when your neck and shoulders begin to feel tense or sore. 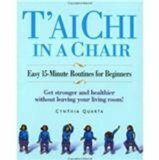 If necessary, click on the illustration above from Michael Reed Gach’s book, Acupressure’s Potent Points to enlarge the view. You can find the acupressure point labeled TW 15 one inch below the top of the shoulder midway between the base of the neck and the end of the shoulder. Press firmly on this point for no less than a full minute. You may bend both arms back and put pressure on this acupressure point on both shoulders at the same time if you wish. This week’s exercise is a variation on the previous one you practiced last week. Here we combine the head movements with acupressure points on both shoulders. If you have had an injury or surgery on your neck, always consult your health care provider before trying any of these exercises. Begin by sitting with your back fully supported by the back of your chair feet shoulder-width apart and flat on the floor. Take 6 to 12 slow, thoughtful breaths in and out of your nose while visualizing the movement of ch’i through the upper part of your body, your neck and head. Bend your arms, curve the fingers of both hands and press on the top of your shoulder muscles close to the base of your neck. Breathe in through your nose then out through your mouth as you bend your head forward slowly toward your chest. Hold for a moment as you gradually increase the pressure of your fingers on your shoulders. Breathe in through your nose again as you return your head to the upright position. Breathe out again through your mouth (continue to press on your shoulders) and lower your head slowly and carefully to the back. Breathe in again through your nose and return your head to the upright position. Continue bending your head forward to the chest and back remembering to breathe out each time you do. Repeat for at least 6 bends forward and backward. 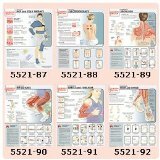 Click on the illustration above from Michael Reed Gach’s book, Acupressure’s Potent Points to enlarge your view. 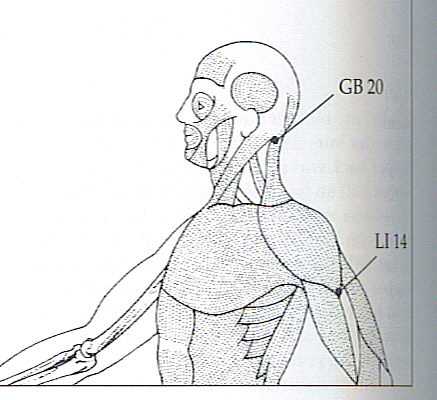 Locate the 2 pressure points on the top of the shoulders labeled GB 21. This is the area you should be pressing on for this exercise. This week’s exercise stretches the thigh muscles and ankle muscles and tendons. Be sure not to lock your knee when you stretch your leg out to the side. Always stretch carefully and gently while breathing slowly and thoughtfully. Sit forward slightly on your chair so that you can stretch each leg out to the side comfortably. Take a few slow breaths in and out through your nose before you begin. Breathe out as you stretch your right leg out to the side keeping your foot flat on the floor so that the outside of your ankle is stretched. Breathe in as you return your leg back to the center. Repeat 6 to 12 times. Stretch out your left leg and repeat steps 2 and 3 for the same number of times as above. When you complete both the exercise with both legs, sit for a couple minutes and breathe in and out through your nose relaxing all yoru muscles. 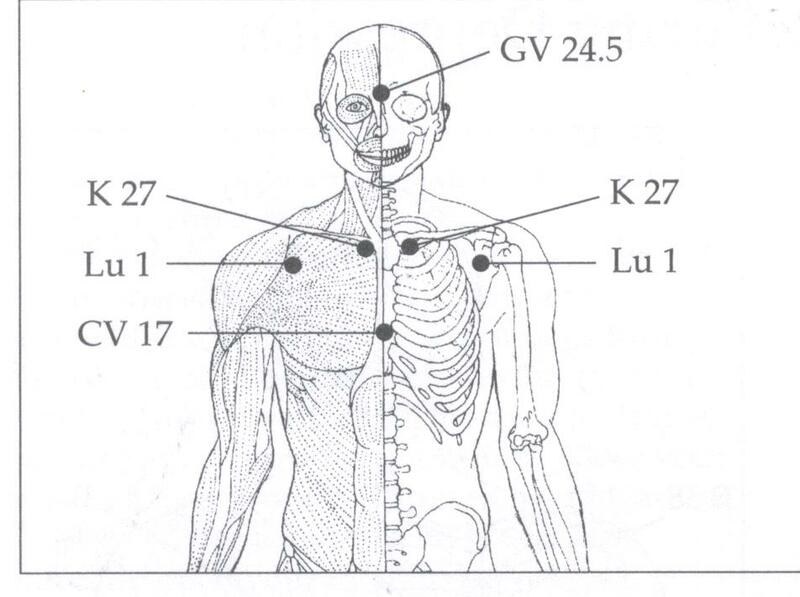 You can find the acupressure point Elegant Mansion (K 27) just below the protrusion of the collarbone directly to the side of the breastbone. Press firmly on these points with your middle fingers for 3 to 5 minutes as you breathe in and out slowly through your nose. Benefits: This point will strengthen the immune system, relieve chest congestion, asthma, coughing and other breathing difficulties. This week’s exercise will loosen your ankles, increasing the circulation to this area as well as encouraging the flow of ch’i. Be sure to breathe in and out through your nose slowly as you do this exercise. Don’t try to match your breath with the movements – just breathe normally. Sit comfortably with your back against the back of the chair allowing for the natural curve in your back (in other words, don’t tuck your hips underneath you). Begin with a few breaths in through your nose and out through your mouth. As you begin the exercise, breathe in and out through your nose only and don’t try to match your breaths with the movements of your foot. Lift your right leg directly out in front of you. Circle your foot clockwise 12x. The reverse and circle your foot counterclockwise 12x. Return your right foot to the floor. Lift your left foot and repeat #4 for the equal number of times. Lower your left foot to the floor and repeat the circles with your right and left feet the same number of times. Click on the illustration above to enlarge the view. Locate the point labeled K 3. You will find the point in the hollow about midway between the inside anklebone and the Achilles tendon. Press firmly on this point with your thumb for 3 to 5 minutes. You may repeat the pressure on your other ankle if you wish. Benefits: This effective point will relieve swollen feet and ankle pain and will also strengthen the ankle joint. We continue stretching toes and ankles in this exercise. Again you will be sitting with your back supported by the back of your chair, spine straight but not strained and legs shoulder-width apart. This position allows the flow of ch’i to more easily move from the lower dan tien through the legs and to the feet and ankles. Take 3 to 6 breaths slowly and thoughfully in and out through your nose before beginning. Lift your right leg directly out in front of you. As you breathe out through your mouth, point your toes. Elongate the arch of your foot – don’t scrunch up your toes! Then pull your toes back toward your ankle to flex your foot. Continue pointing and flexing 12 times. Change legs and repeat the exercise with your right foot. 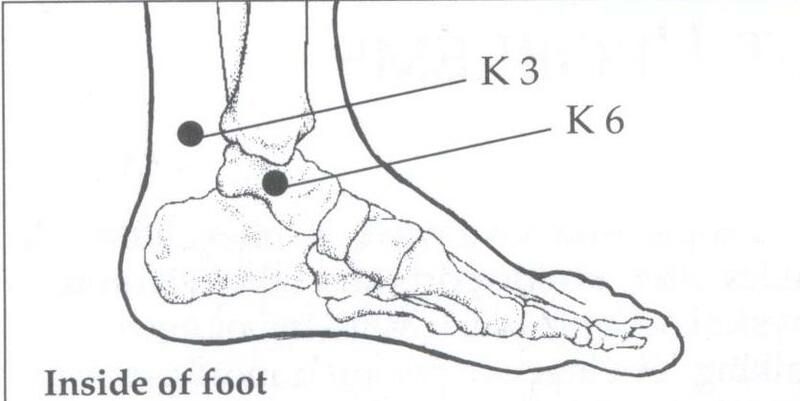 You can find this acupressure point in the large hollow that is directly in front of the outer side of the anklebone. Press slowly but firmly into this point. Hold your finger on this point for 3 to 5 minutes breathing slowly and thoughtfully in and out through your nose. Change feet if you wish and repeat the previous steps on your other ankle.